Tucked away in the busy alleyways of Camden High Street in London is AcuMedic, a traditional Chinese medicine (TCM) center that has been slowly making waves over the years. 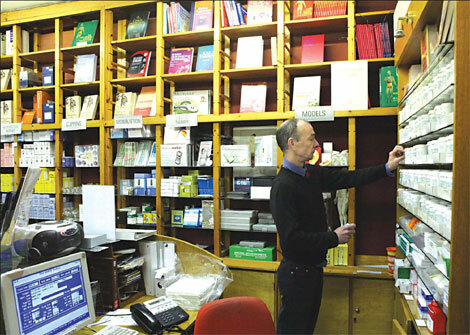 Set up in 1972, AcuMedic is now the biggest TCM shop in the UK and has under its wings several departments, a full-fledged clinic with consultation rooms, a bookstore that gives insight into TCM, a shop that sells Chinese health products like green tea and dried chrysanthemum and a pharmacy that sells herbal medicines. Mei Man-fong, the founder of AcuMedic, who says he is in his 60s but looks much younger and dapper, settles down for his interview with China Daily with a cup of green tea. He says that he owes his sprightly appearance to TCM. Mei says that roughly 500 patients visit the center every week, with the total number of registered patients having crossed 250,000 till date. His most famous patient was the late Princess Diana who visited the center in the 1990s under the name of “Mrs Wales” for acupuncture treatment to relieve stress. Recalling those years, Mei says Diana’s visit was like a springboard for TCM clinics in Britain. But the years of steady growth may soon disappear if the new European Union (EU) directive on herbal medicines comes into being fully. Under the EU’s Traditional Herbal Medicinal Products Directive (THMPD), herbal remedies will now only be available on prescription from practitioners and all over the counter medications need to be registered and approved by the Medicines and Healthcare products Regulatory Agency (MHRA). The MHRA is a British government agency responsible for ensuring that all medicines and medical devices are safe. “If the THMPD is fully implemented, TCM will face huge obstacles,” says Mei, adding AcuMedic sells more than 129 Chinese herbal medications. Richard Woodfield, the MHRA’s head of herbal medicine policy, said in a recent interview that the legislation is important as until now, consumers had no clue on whether the medications were safe for use. TCM practitioners, however, feel that the procedures are too complicated and due to the extensive quality checks of the ingredients, many Chinese herbal products may not be registered by the MHRA. Unlike other herbal medicine products, most of the TCM remedies consist of different kinds of herbs. “The procedures are quite exhaustive. It extends to quality assurance. And the more herbs you have in a product, the more complicated it becomes,” says Michael McIntyre, chairman of the European Herbal & Traditional Medicine Practitioners Association. “That is one reason … why the THMPD is an unsuitable vehicle for Chinese traditional medicine. Many TCM products have six or eight herbs and in some cases up to 14 herbs,” McIntyre says. Liuwei Dihuang capsules, a classic TCM remedy from the Song Dynasty (960-1279) eras, is one of the most popular remedies in the UK market for kidney nourishment. But the capsules have six herbs in them and each herb may in turn contain several chemical ingredients. With such a complex structure, getting the approval and registration can often be a time consuming and expensive process. “There are also several other reasons as to why the THMPD is not a suitable vehicle, or a suitable law, for the TCM. “TCM is not like Western medicine. You can’t just say that you have a headache and pop a painkiller. It is a problem that needs to be checked before medication is given. Even if there is strict quality control, how does one market the products,” he says, adding THPMD is not suitable for legislating Chinese medicines. The THPMD first became a law in the UK in 2004. McIntyre says that very few people paid enough attention to it at that time due to the seven-year transition period with it. Products registered under the new dispensation have “very limited” till now, say British media reports, “with just 50 herbs being included”. Not a single Chinese medicine product has, however, been registered. Shen Huijun, president of the Association of Traditional Chinese Medicine (ATCM) in the UK, however feels that all is not lost for the TCM sector even if the new laws come into effect. In the UK market, according to Shen, acupuncture accounts for 60 percent of the sector while herbal medicines constitute the rest. Even when the THMPD is fully implemented, only the industrially manufactured herbal products will be banned. They only account for about a quarter of the all the Chinese herbal medicines in the market. The sale of loose herbs and other self-made products will not face any restrictions, he says. Shen also says that there is even “no need for retailers to withdraw manufactured products immediately, as retail sales are allowed till the shelf life of the products expire”. At the London branch of Tongrentang, a Beijing-based time-honored TCM brand and the biggest TCM producer in China, it is business as usual. Employees at the facility say that they have so far not received any notice to withdraw products or make any significant changes. Over 150 Chinese herbal medicine remedies, mainly those for curing depression, gynecology and skin diseases, are popular in the UK. Shen, however, admits that some TCM product pharmacies may go out of business when the THPMD is fully effective. “But the sector will survive,” he says. Even as the THPMD clouds gather, TCM practitioners are busy looking for new strategies to continue their business. Another development that may augur well for the industry is expected to come out next year. From 2012, the British government plans to introduce additional statutory regulations for all herbal medicine practitioners and will be enforced by the Health Professions Council (HPC). The new rules intends to give herbal therapists licenses to prescribe unlicensed herbal medicines that have not been registered under the THMPD. “We initially thought that there was no hope until the HPC registration for herbal medicine practitioners was launched. Now, we feel that there’s a ray of hope,” says Mei. But with HPC registrations not slated to start until April 2012, the intervening period may be tough for TCM pharmacies, says Mei. But the important thing is that the new dispensation means that TCM practitioners will finally get legal status in the UK, says Mei, who has been fighting for decade to push TCM into the mainstream. There are roughly around 2,000 TCM clinics and practitioners in the UK. Currently, anyone, including those without any academic and strict training, can open a clinic and call himself/herself as a TCM doctor. The House of Lords in November 2001 submitted a report on complimentary medicine and acupuncture to the government, marking the start of the effort to legally regulate TCM and other herbal medicine practitioners. The HPC was founded a year later. On Feb 16 this year, British Health Secretary Andrew Lansley reiterated his government’s decision to enforce the regulation from April 2012. “It will no longer be legal for herbal practitioners in the UK to source unlicensed manufactured herbal medicines for their patients as the THMPD takes full effect in May,” Lansley says in a written statement to the Parliament. “This Government wishes to ensure that the public can continue to have access to these products,” the statement says. “The major roadblock for TCM practitioners would be their ability to master English and it could finally tip the scales for an HPC registration,” says Shen. A key criterion of the HPC registration is that all TCM practitioners should achieve a score of 6.5 in the International English Language Testing System (IELTS). That score is equivalent to the entry requirement for master’s degrees in most British universities. The ATCM, one of the oldest and biggest TCM practitioners’ organization in the UK, is now in talks with the HPC, to lower the English score threshold.